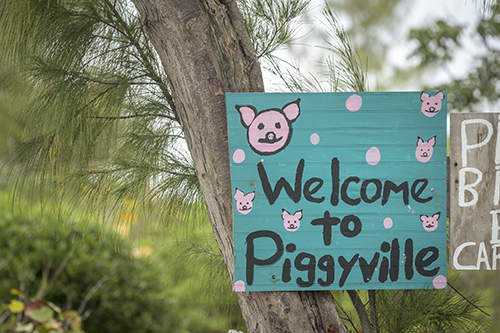 Many have heard of the swimming pigs of Staniel Cay in the Exumas, but not so many know about Piggyville on No Name Cay in the Abacos. The last two times we were in the area, we didn’t have time to visit, so this time with a very fluid schedule we made the time. And Beatrice from our buddy boat was full of delight to finally see the wild pigs of the Abacos! There were lots of children having fun feeding the pigs, which is encouraged, and we couldn’t help think of the grandkids in the North and how much they would enjoy this too. So incredibly cute! And so much leaner and trimmer than any pigs I’ve seen before (i.e. domesticated ones). They hardly look like the same species! Oh my goodness, they are just precious, Sherry! What fun this must have been. Did a double-take – the young girl with the iPad could be Niah!